During the previous year April 2015 to March 2016, 238 (Two Hundred and Thirty Eight) Schemes were filed. 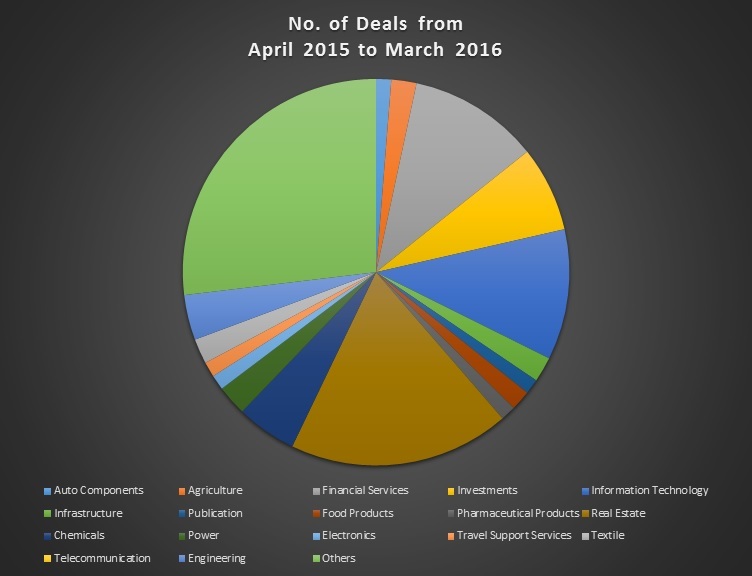 The diagram shows that the Real Estate sector had the maximum numbers of deals cracked during the last one year with 44 deals in total, followed by Financial Services and Information Technology sectors with 26 deals each and Investments sector with 17 deals. ‘Others’ includes various sectors like Infrastructure, Jewelry, Media and Auto Components to name a few. Some other important details regarding Schemes filed during the previous year April 2015 to March 2016. There were 87 schemes between holding and subsidiary companies, i.e. these companies have gone in for internal restructuring. There has been a trend of a merger between holding and subsidiary company to gain from the synergy of resources. There were 102 schemes in which Transferor Company had carried forward losses and the Transferee Company was profit making, thus the Transferee Company was able to acquire those companies at low prices while the Transferor Companies were able to exit business by gaining fair value for their loss-making business. There were 68 schemes in which Transferor Company was profit making and the Transferee Company had carried forward losses, which were reverse mergers. Thus the Transferee Companies were able to seek relief under section 72A of Income-tax Act. There were 86 schemes in which Transferor Company and the Transferee Company both had carried forward losses, thus the companies were mainly aiming at a joint revival of the both transferor and transferee companies through the said schemes.